Today's HOF Candidate has a bunch of local ties Souderton HS Alum, St Joe's University Alum, and Starting pitcher for the 2008 World Series Champion Philadelphia Phillies. To me Jamie Moyer is a baseball hero just for pitching until he was 49 years old. I will spare you the suspense - to me Jamie Moyer is an absolute Hall of Famer. Deep down inside I realize the mans numbers are just to mediocre. 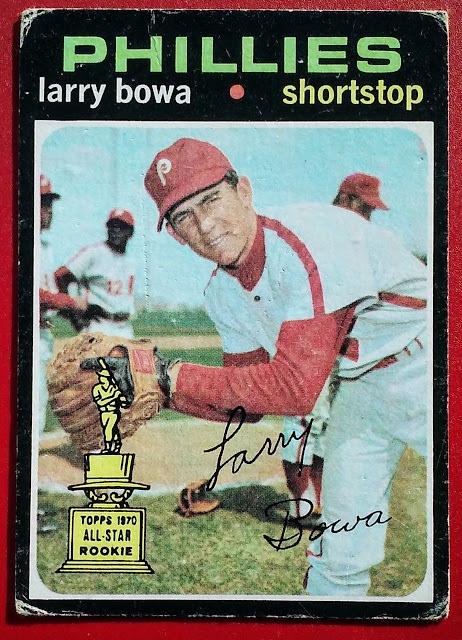 His big number is his 269 victories, 56 of which came for the Phillies. Of course that is an accumulation in a stat category that is going out of vogue. Regardless his 50+ WAR is very respectable ranking 110th all-time, better than a handful of Hallers most notably Sandy Koufax. Of course Moyer doesn't have the accomplished Postseason of Koufax who was twice voted World Series MVP. 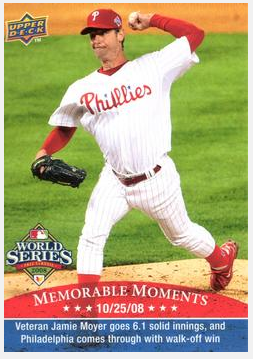 The above card honors Jamie Moyer's only World Series appearance. With the series tied 1-1 Moyer took the mound in the Phillies first Home World Series game in 25 years. The rain delayed game did not start until after 10pm and would not end until nearly 2 the next morning. Moyer the Veteran and True Professional did not let the inhospitable conditions bother him. He put together 6.1 innings leaving the game with a 4-2 Phillies lead. A lead the bullpen would relinquish, however the Phillies eventually won the game 5-4 on a crazy finish - Reserver Eric Bruntlett reached via Hit By Pitch, moved to 3rd on a throwing error by Rays Catcher Dioner Navarro, and scored on a Carlos Ruiz dribbler. The Phillies scored the winning run without hitting a ball out of the infield. 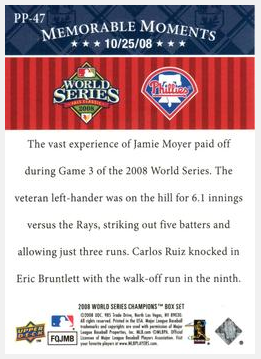 The flip side of the card gives a brief synopsis of the game 3 of the 2008 series. 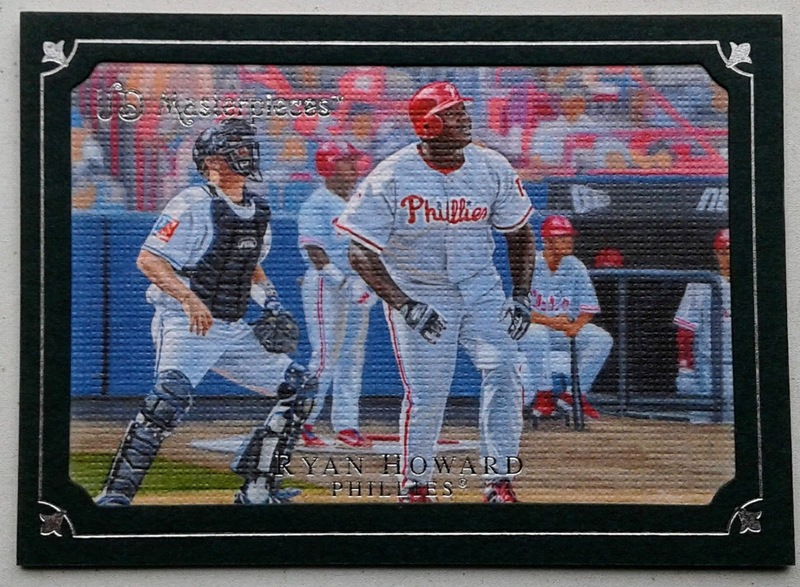 For more information Upper Deck's 2008 World Series Box check out Cliff's posting over at Capewood's Collections. On December 6 2002 the Philadelphia Phillies announced that the long struggling club was ready for big time when they signed free agent slugger Jim Thome. Things didn't work out as well as Phillies fans would have liked but the short-lived Thome era did have some fun moments. Over the course of his first two seasons in Philadelphia Thome hit 89 Home Runs including a league leading 47 in 2003. 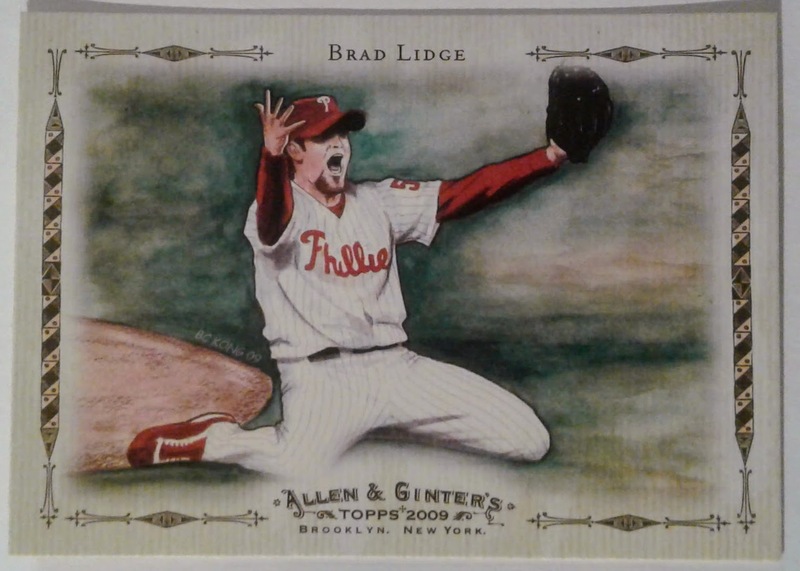 Topps honored the league leading season by putting Jim Thome on the #1 card of it's 2004 set (AL HR Leader Alex Rodriguez got 2004 Topps next hero card #100). 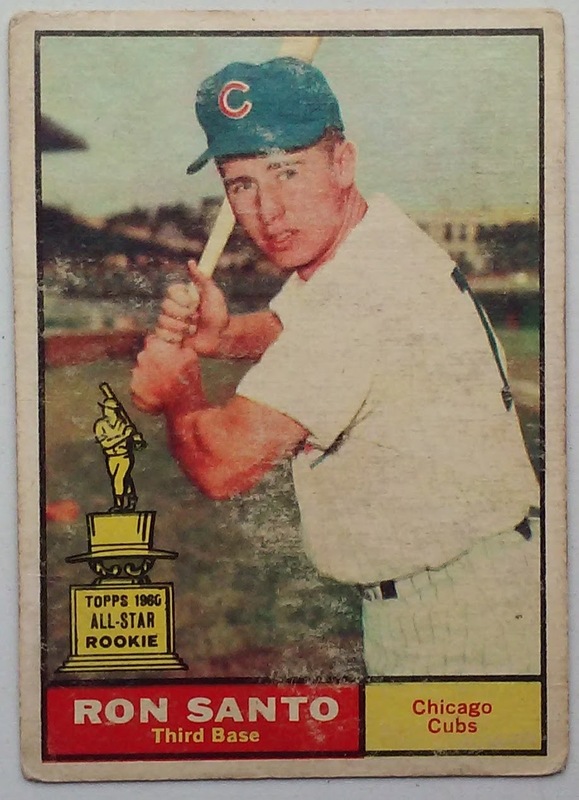 Good looking card and I am glad that Thome was recognized by Topps while he wore a Phillies uniform. The team didn't make the playoffs while Thome was here, but it is my opinion he was a key stepping stone to getting the team to a competitive level. 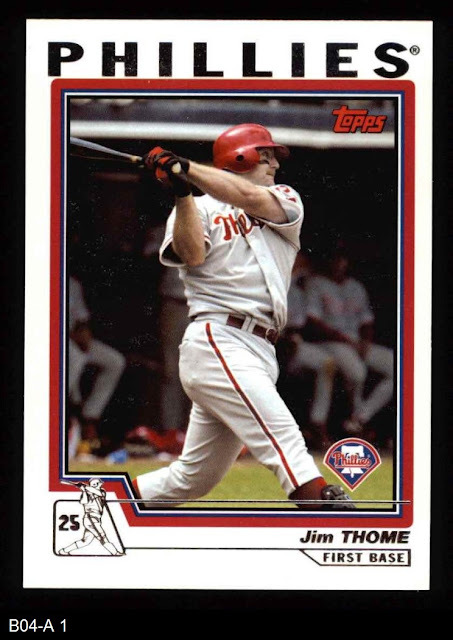 One of my favorite moments of Jim Thome's tenure in Philadelphia was his 400th career Home Run which came during a Phillies 10-7 victory over the Reds on June 14 2004. The game is briefly discussed in our 2006 Wall of Fame posting. On the top left of the back of the card we can indeed see that this is the #1 card in the set. 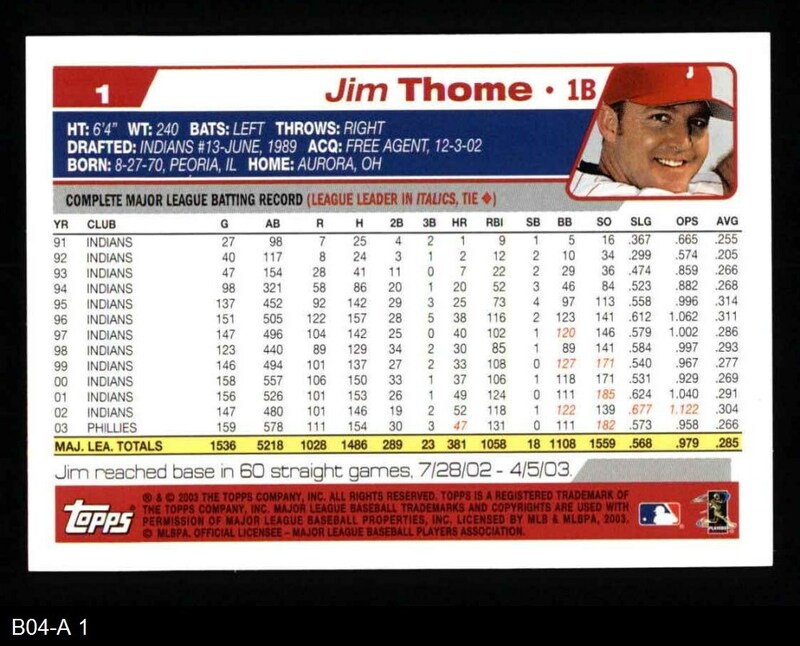 It also shows Thome's inaugural Phillies stat line which notes his league leading 47 homers in red (as well as his 182 Ks). 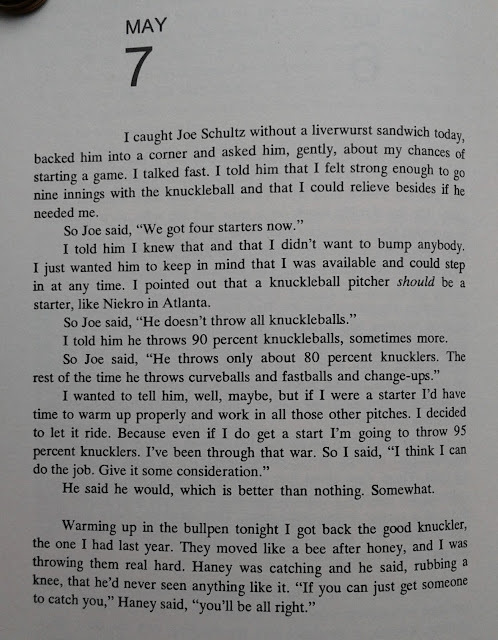 The short text blurb touches on Thome's other strength, getting on base. The 60 game on-base streak was stopped by pitchers Kris Benson and Scott Sauerbeck during a 2-0 Pirates victory over the Phillies. Topps also put Jim Thome on the #1 card of the 2004 Heritage set. 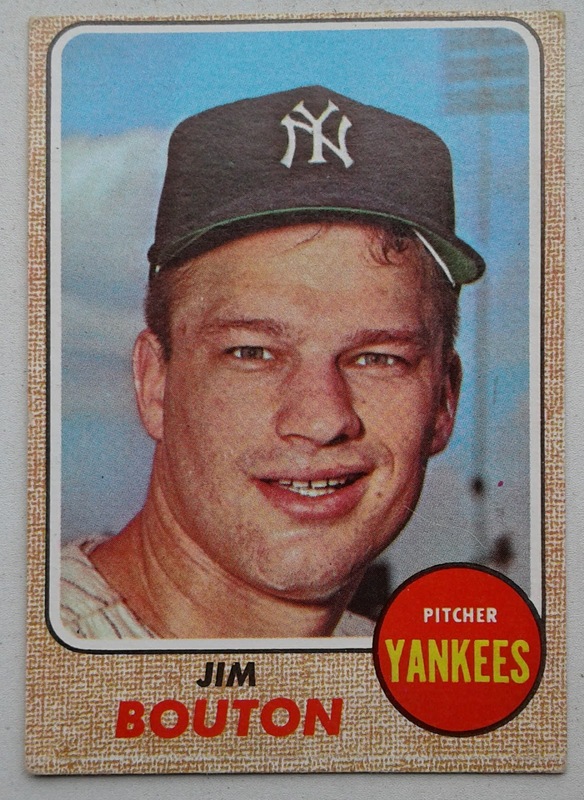 HOF - Big Fan, 600 Home Runs, Great Guy. The second installment of our 2018 HOF Candidates is on journeyman pitcher Kevin Millwood who had a pretty decent career. 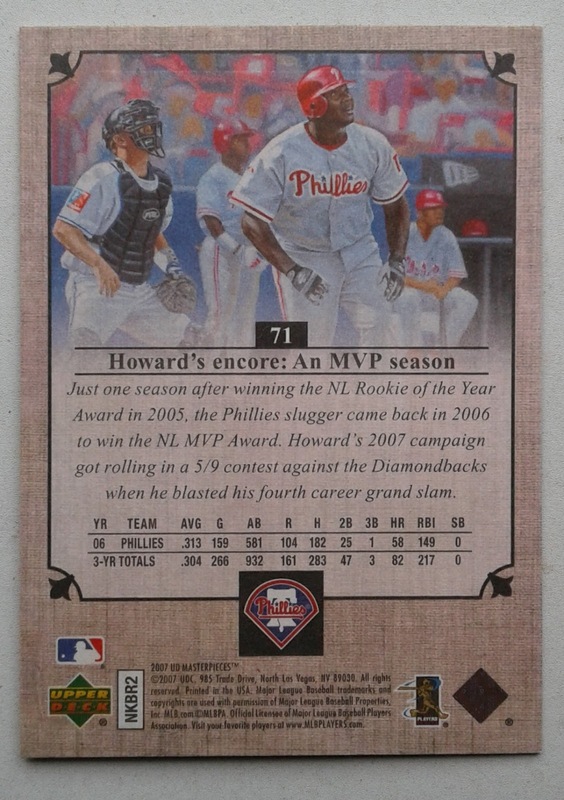 His two year stint for the Phillies was fair at best, however there were some big moments during those 2 seasons. His biggest of those moments was on April 27 2003 when Millwood authored a 1-0 No-Hitter versus a San Francisco Giants team that was anchored by Barry Bonds batting clean-up. 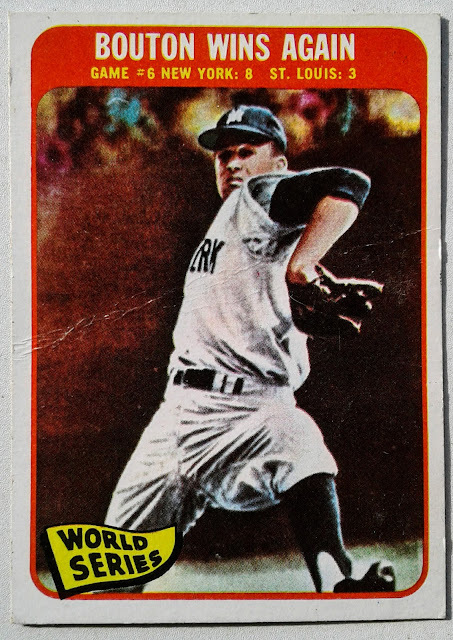 Topps recognized the accomplishment in their 2013 Gypsy Queen No-Hitters insert set. Decent looking card which fits the GQ motif. I like that Topps added the uniform number to the front of the card. While looking at this card it occurred to me an awful lot of No-Nos have been tossed by players wearing #34. Within the 15 card 2013 GQ No-Hitter Insert Set alone there are several: Millwood, Felix Hernandez, Homer Bailey, the recently deceased Roy Halladay, and of course Nolan Ryan. This card also hit on my continuity error nerve. Millwood pitched his No-Hitter at the Vet and yeah that is obviously not the Vet. In fact our here is shown here wearing a road uni - so this game was not even played in Philadelphia. 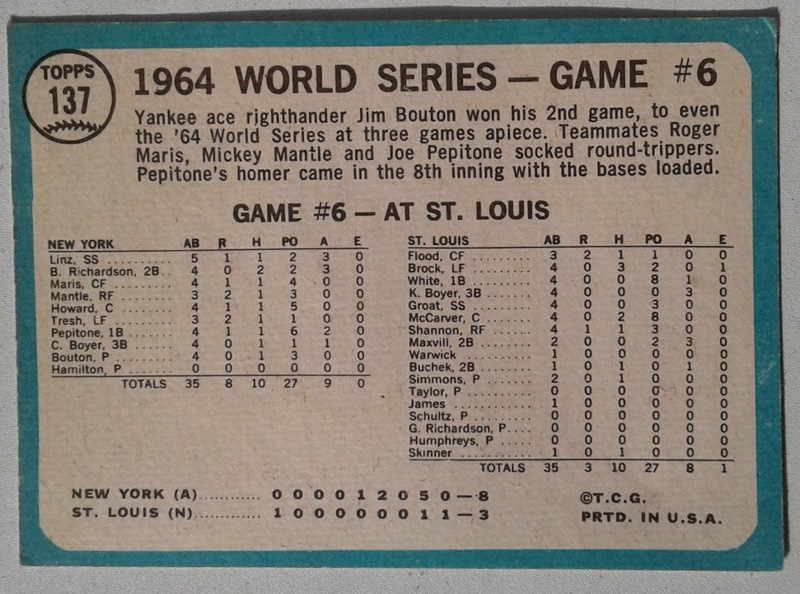 Functional back text doesn't really bring out the excitement of a no-hitter. Topps first cover Millwood's No-Hitter much better in their 2004 offering which is discussed here. In addition to Pitching the No-Hitter for the Phillies, Kevin Millwood also started the final game ever played at the Vet. Unfortunately the game was a 5-2 loss to Millwood's former team, the Atlanta Braves. Obviously that is not the difference maker in Millwood's credentials. 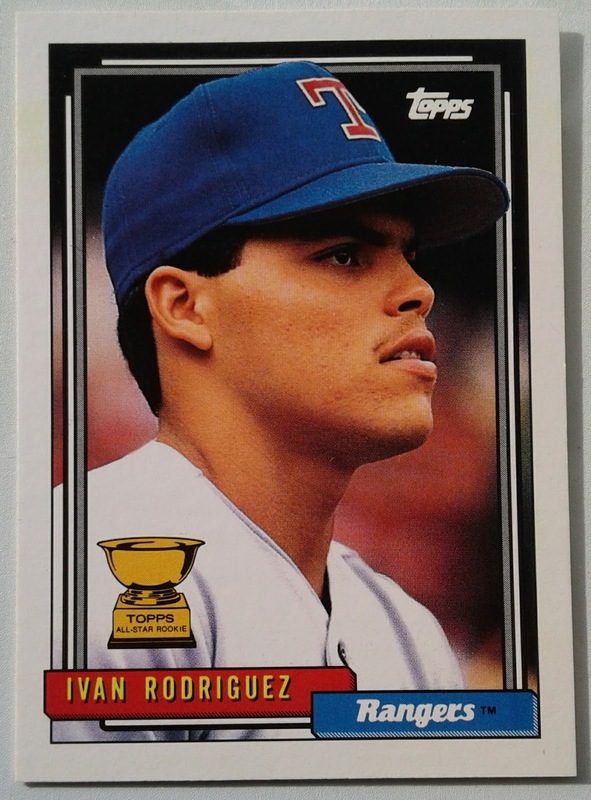 He is a respectable 30+ career WAR player, who racked up 169 Ws during a 16 years career. His Cy Young peak was #3 in 1999 (Randy Johnson). 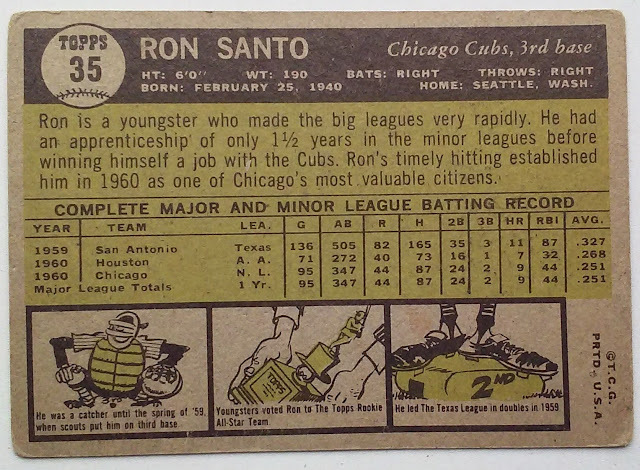 That season featured his sole All-Star and World Series Appearances. Good pitcher, rough Phillies tenure despite some big moments. Verdict VETO. 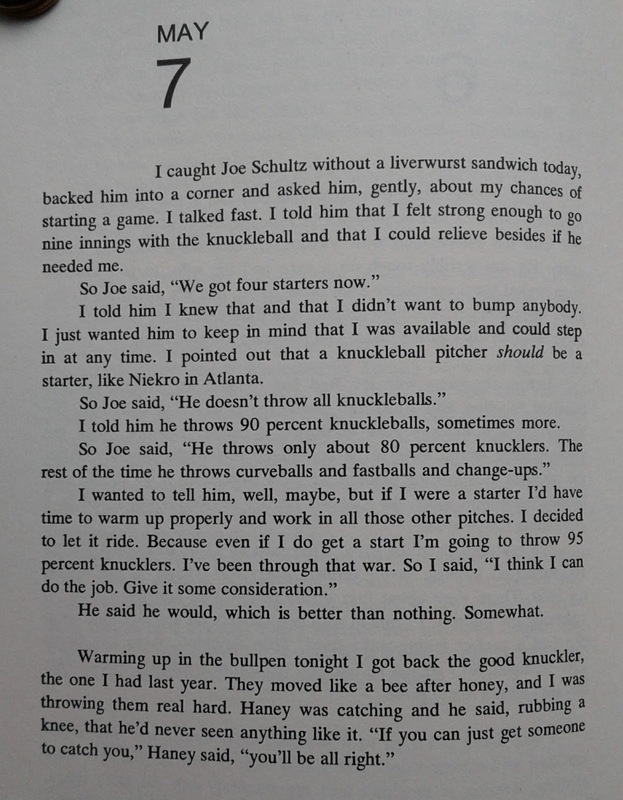 This is an index to our feature on the 25th anniversary of the 1993 NL Champion Philadelphia Phillies. Each of the last couple of years I have reviewed a couple of Hall of Fame candidates and gave my verdict. Tonight we return to the feature to look at the 2018 candidates. The first subject that we will look at is Scott Rolen. I am not sure if "polarizing" is the word to describe Scott Rolen. He is kind of a low key guy but brings out a lot of opinions in folks. He was a great player in Phladelphia on bad teams - eventually he got tired of playing with the struggling clubs and pushed the Phillies to trade him. That is where the story gets tough for Phillies fans. Baseball is a business and Scott Rolen as a player as a limited time to earn a living - regardless it hurts a little to see a player asked to be traded away from your favorite team. For our Scott Rolen Profile I have chosen a card that falls under our Gamed Dated obsession. Over the last 25 years I estimate that I have been to about a dozen opening day games including the one played on April 5 2002. 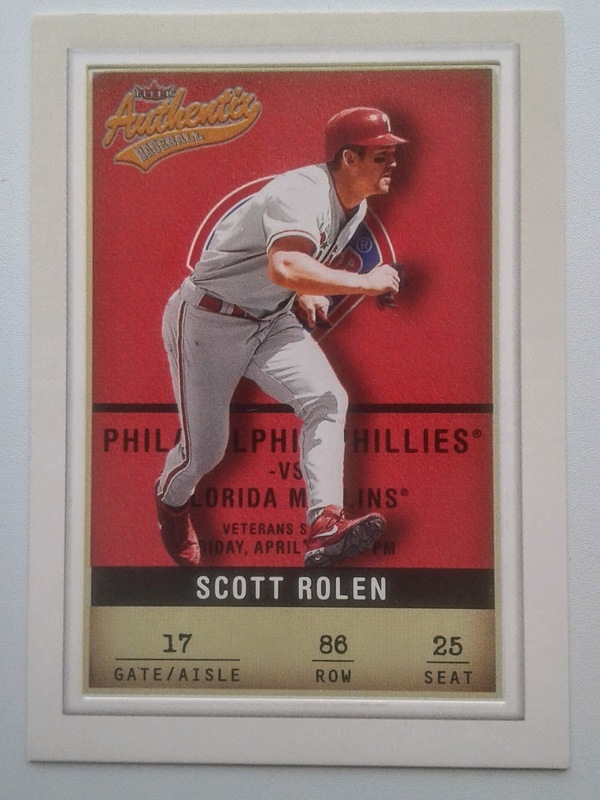 The above Scott Rolen card is made to appear like a ticket to that 2002 Phillies Lid-Lifter (fun term I have seen in old school Sporting News headlines, but never hear anymore). The Phillies defeated the Florida Marlins 6-2 in this particular opener. Not all of this info is given on the Fleer "Ticket". We can see "Florida Marlins" hidden behind Rolen's legs. Also Veterans Stadium. The Date is pretty much screened but we can make out Friday and April. The full date was April 5th 2002. 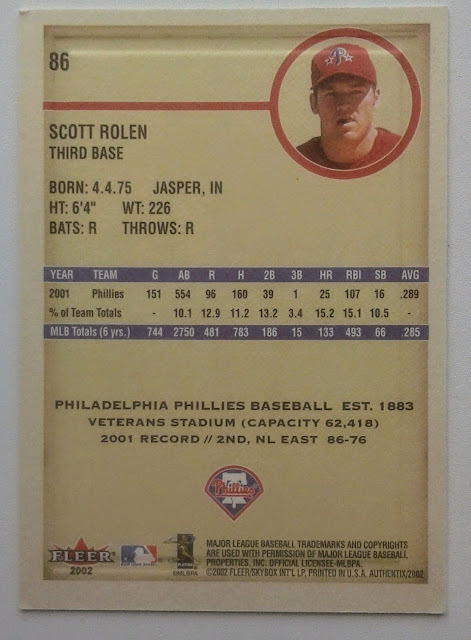 I am happy to say it was a good day for Scott Rolen who reached base all 5 times he batted. His plate appearances resulted in a double, single and Three Walks. 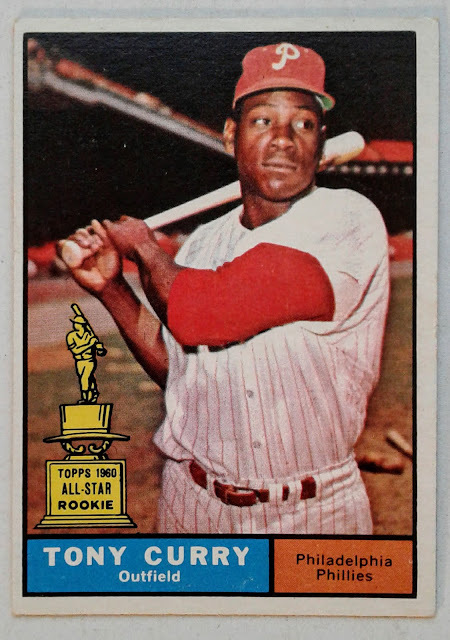 The Phillies other offensive hero was Bobby Abreu who logged a 3-Run Homer as one of his four hits. Brandon Duckworth got the W pitching six innings of 1-run ball and racking up 10 strikeouts. Couple of things to note on the back of 2002 Fleer Authentix. The % of team totals line is an interesting stat idea, easily demonstrates what Rolen meant to the Phillies offense in 2002. The card finishes with Phillies franchise info. I suppose that feels somewhat connected to a card noting the teams Home Opener. 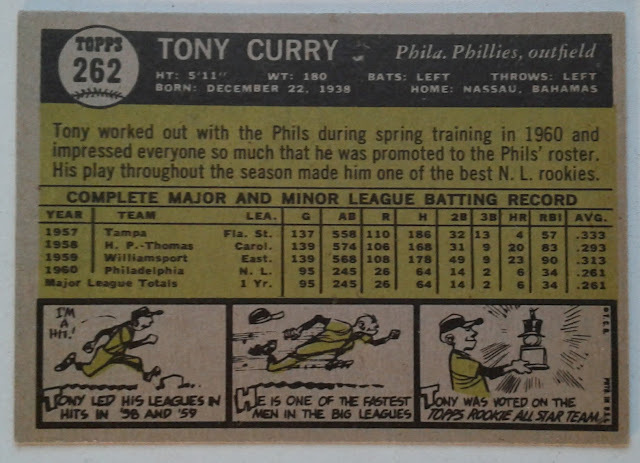 Also note that the card represents a game played in 2002 but the stats on the back are for the 2001 season. 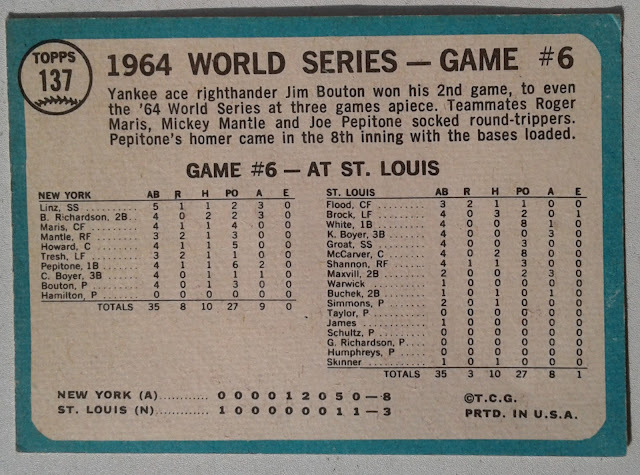 Someday I will dig through the Phungo Ephemera Museum and get an image of a real ticket to this game and plop it into this posting, however right now I am to busy/lazy to go through that effort. I think this will surprise folks who know me but Yes I think Scott Rolen deserves Hall of Fame recognition. He is borderline, but when I remove my biases against him, as a player I think his numbers are HOF worthy. I don't think it will happen but it would be nice if the Phillies and Scott Rolen could get together so that he could be recognized on the franchises Wall of Fame. Yesterday we got the news that Roy Halladay died in a plane crash. While the circumstances are horrible, it was good to hear all the reports of what a terrific person Roy Halladay was off the field. He appeared to be enjoying his post playing career spending time with his family and friends. During a press conference yesterday Cole Hamels showed tremendous poise, articulately discussing Halladay as a Mentor, Ballplayer and Friend. For out tribute to Roy Halladay I went with a picture of him from the Phillies 2012 Photo Day rather than a card. After hearing so many folks talk about how great Halladay was as a person, I wanted to note the person rather than the ballplayer. 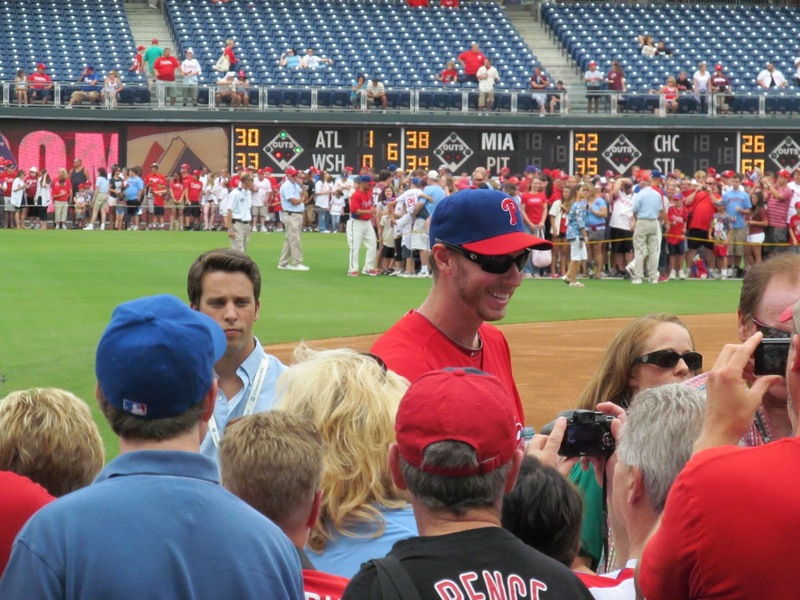 Here is an index of the many Roy Halladay postings that have appeared on Phungo. The NLDS No-Hitter in 2010 will always be one of my favorite sports memories, you can see some pix and read a few of my thoughts here. Blogs are not as active as they were at one time, but I will be adding the Roy Halladay tributes to this posting as they arrive. This is an index to our postings related to the closer for the 2008 World Series Champions, Brad Lidge. Yesterday we got the sad news that Rollie Massimino had died at the age of 82. I am not originally from the Philadelphia area but I will always remember the 1985 Villanova Wildcats championship team. Winning that game made me a fan of the team for life. I never expected to live in the Villanova community, but life's twists & turns brought me to a place where I reside less than five miles from the campus. The team has now returned to prominence and it is fun to be able to follow the local team. I have gone to the opening rounds of March Madness when it has been hosted in Philadelphia several times. In 2009 I was checking out the lower level prior to the game and talking to a friend when Rollie Massimino passed right in front of him. We mentioned to Rollie how much we enjoyed the 1985 Championship team. He was congenial said thanks, shook our hands, posed for a picture and signed our tickets - the smudge and the fact that it is signed upside down are my fault. Regardless it is a cool memory to have and one of the more fun artifacts in the Phungo museum. The picture I took made it onto a Phungo card back when I still made them. This is pretty early in the Phungo canon so we have a pretty vanilla design with the text being a snapshot from an excel spreadsheet. Pretty primitive, but considering my minimal graphic arts skills at the time, I am pretty proud of the finished product. I have a posted a few dozen of my photos to Wikipedia, this is the first of those pictures. 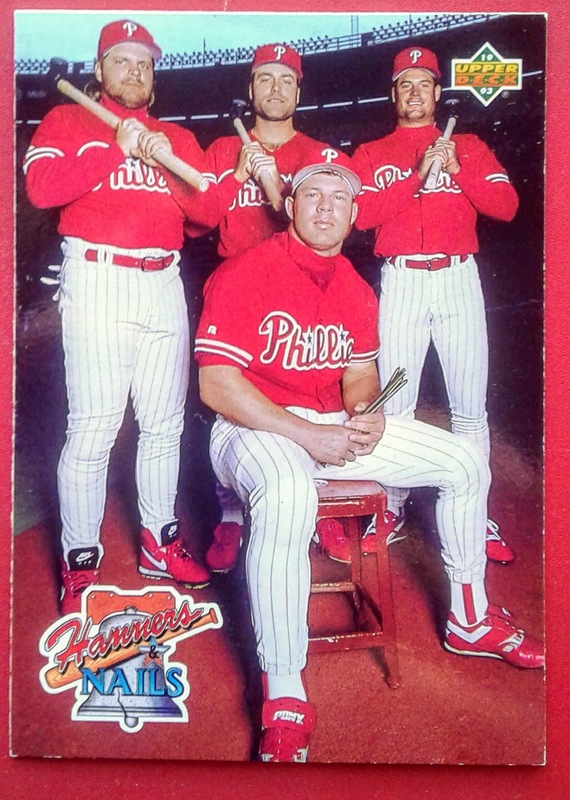 Earlier this month we got the news that Darren Daulton had died. The beloved catcher was the anchor of the 1993 NL Championship team. Ten years later he also beat out Bob Boone for the honor being the catcher on the Phillies All Veteran Stadium Squad. The day the Vet closed the Phillies gave out 12 card packs of cards honoring the All-Vet team. 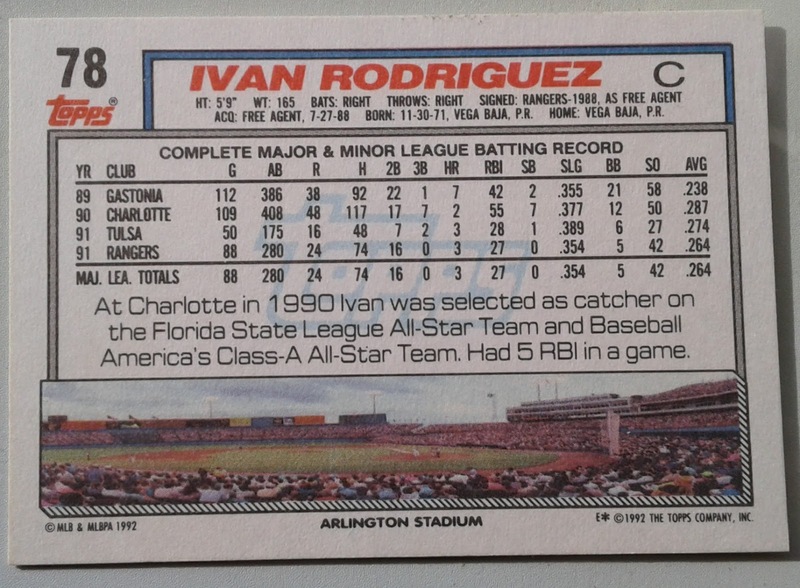 Most of the players were either members of one of the three teams to play a World Series at the Vet (1980, 1983, 1993). The Phillies lost to the Braves 5-2 that day, but it didn't matter. As fan I was there to say goodbye to the Vet and recall all the good memories I had at the venue. Darren Daulton's passing occurred shortly before Alumni Weekend and the Phillies honored the All-Star catcher by painting his #10 behind the plate. Alum introductions closed with a about a dozen of his 1993 teammates entering the field wearing his #10 jersey and encircling the plate area in tribute. The above photo is one that I have simply titled "Three Catchers". The pix was taken between innings, at the right you have Jorge Alfaro entering the frame while Cameron Rupp exits. The two were both on field at one time because Alfaro was either on-deck or on base during the previous half inning while Rupp was in to warm up the pitcher. The third catcher in the picture is Darren Daulton, memorialized here by the #10 behind the catchers box at home plate. 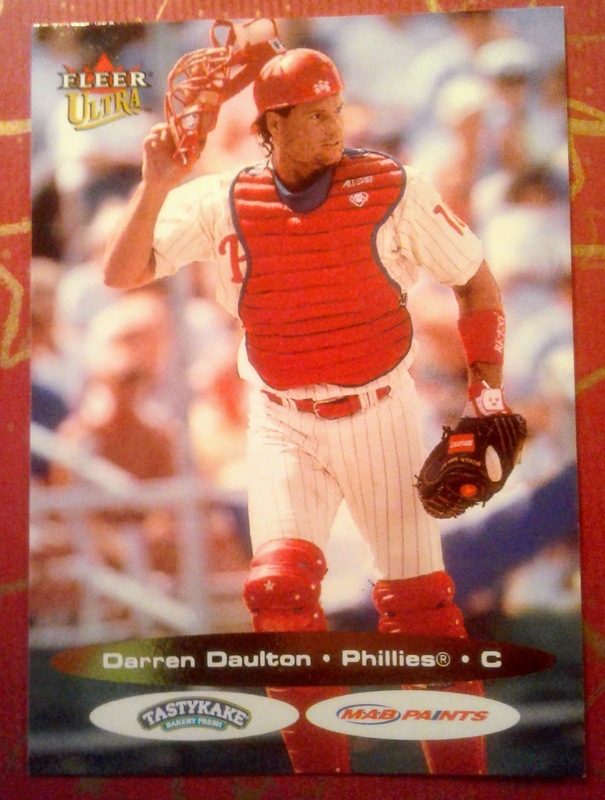 This is an Index to our postings related to Darren Daulton.